Check all our Air velocity indicator range. Click here if you want to know more about anemometers. The OM-CP-WIND101A is a complete system to accurately record and measure wind speed. 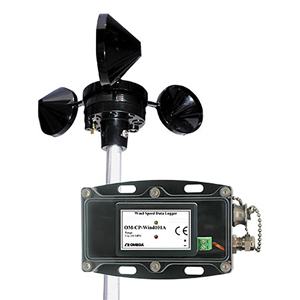 This low cost wind speed recording system comes complete with a data logger, weatherproof enclosure, a three-cup anemometer and all the necessary cabling to quickly get up-and-running. Nota: Comes complete with 3.6V lithium battery and OM-CP-IFC200 package which includes the Windows software, operator’s manual and 3.7 m (12') USB interface cable.